Writing: fixing plot holes--complete with pictures! When I started seriously writing almost two years ago, the barest essentials were all I had. Being a broke college student, it basically translated to: Ramen Noodles, the weekly Starbucks coffee from Sarah, and my computer. For the most part, it was the two of us, sitting on opposite couches, drinking French-pressed coffee, and listening to Two Steps From Hell or Transformers soundtrack. Nothing was more fun that that--the incessant giggling as we realized what was coming, or funny lines that we put in there. Today, not much has changed. You can still find us sitting in her room, compies on our laps, coffee nearby, music playing from the speakers, still laughing at our own creative geniuses. 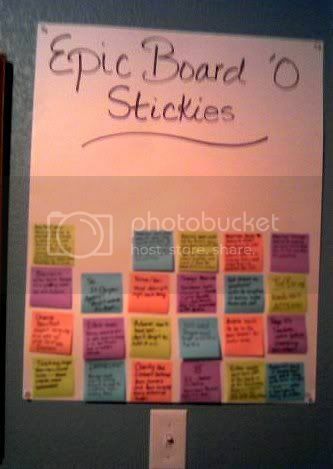 That's right, me and Sarah's "Epic Board 'O Stickies' or 'Epic Board 'O Plot Holes' as I also like to call it. Of course, not all of these pretty little squares are holes. 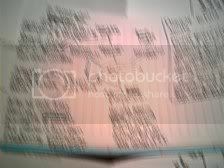 Some of them are future references, sections I would like to make better, or info on things like people or societies. But I won't lie, 2/3 are plot holes. I've also realized just how mean/demanding/snooty my inner editor can be. I do believe one of the stickies on the board reads in regard to a certain scene, "Too boring! Get more action in there." "So, is Dayne ageless? Might want to fix that." "Trackers come before branding, not after." Alright already! I'll fix it when I'm finished writing, sheesh!" I've already mentioned coffee once, so I'll just say, 'God Bless!' and move on to notebooks. Now, I'm really not one to be writing in notebooks--unless of course, I'm sitting in a three hour Econ class that I would always leave half way through every class because the professor was so monotone that I could barely keep my eyes open. Not sure how I ended up with a B-, but I just went with it. Anyways, yes, I have written in a notebook before. I actually had a good...hmm...I dunno--50 pages of my old draft in misc notebooks scattered around my apartment. While I preferred my computer, I couldn't deny the appreciation I would give notebooks on those days when I had to wait some where for a doctors app or vet trip. Recently, I decided to map out my thoughts, tidying up everything in my mind, straightening out the clutter. For the most part, there was a lot of scratching things out, smushing words into a corner, drawing a bunch of arrows. Had I not made it blurry, you'd be able to see the pure chaos going on here. The funny thing is, it completely worked. Brain unblocked! Clutter removal attempt: Successful! Some days just don't go as smoothly. After attempting to write a decent, fairly emotional scene, I found myself making things worse. Not only was I repeating words within the same sentence, it took me forever to spell everything correctly. I was constantly backspacing words and retyping them once, twice--three times even. At that point, I gave up. No writing that night. It was just souring my mood. Instead, I decided to work on something I haven't done in a long time: a puzzle. 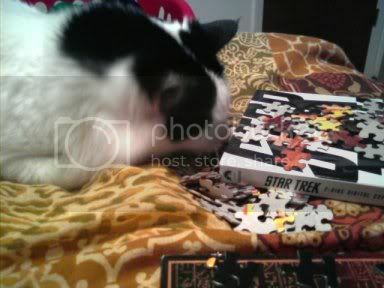 I'm not sure entirely what it is, but for the life of me, I swear puzzles are cat-magnets. The moment I had set it on my bed and grabbed up a small table, she was there, gnawing on my mini masterpieces. Not sure how many times I had to shoo he away (which didn't work. She got grumpy, I got grumpy) but eventually, I managed to work around her. I had forgotten how A.) good I was at puzzles and B.) how long it kept me preoccupied. I had started at around 10pm, and when I looked at the clock after being 2/3 of the way done, it was 4am. Oops. I set it aside, went to bed, and finished the rest of it within the hour. It was a nice break. After finishing it, I hopped on the computer where I started writing, getting a nice chunk done in FNW. I had to stop eventually because of an approaching plot twist, but it was nice to blow past the 30k mark, and even the 31k mark. I'm currently sitting pretty at 31,178 words, a plot hole free in my head (as far as I can tell. There's a lot crammed in there) and a maybe-query which I'll send Sarah's way. I'm pretty sure it's crap, because I don't like it, but I like her opinion. So what's your helpful tools? Any other programs, methods and/or items that help get you out of trenches and holes? I am a sticky note person too! Except my stickies are scattered across my desk :D I am not as neat as your epic board of stickies, although that's such a great idea! I actually do write more of my internal editor stuff on the stickies and future scenes as well. Sometimes I'll write down what suggestions others have said. Also, I ALWAYS have a mini 5x7in. notebook in my purse or a bigger notebook in my backpack. Never leave home without at least my mini. I also have this lucky purple pen that I almost freaked when I lost. It's one of those BIC pens that are sparkly. Preeety. I think that's it for methods/items that get me out of trenches/plot holes. Oh yeah, and I love brainstorming with someone. Most of the time, it'll be my own idea I use, but they'll say something that leads me to that idea and if I like getting my thoughts out there, too. So yeah, that's it! Great post by the way! I think I'll post what I've said on here in my own blog post! Lol yours in so much more organized then mine! Failsauce on my part. I find blog posts like this and forum posts very inspiring. It makes me want to write. :) Wow, you are very organised. Sticky notes don't seem to work for me! 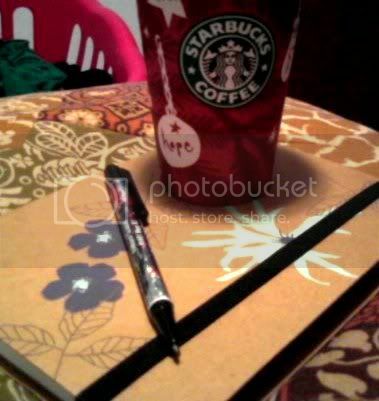 I use software like EverNote or MS OneNote for my notes. I don't really write in notebooks, but I do love Moleskine notebooks. They're not cheap (I pay about 16-17 euros for them), but that makes me want to write in them more. i can haz riting tyme?